Hey everyone, this week we’re going to tie up a few things. Having nailed the basics of Definitions and the Principles of Training (POT), we can now sensibly progress to answering the questions like? – Should we move away from 3 sets of 10-12 reps? – Should I do 8 reps with heavy weights or 30 reps with a lighter weight? Thank you to people such as @dansilver32, @Retlouping and @tomgoom for firing these questions over. when you stipulate lift to failure (the RM principle), and even then we can do better! An educated guess would be that we generally give out these exercises on printed pieces of paper without individualising the prescription OR stipulating what determines exercise cessation (i.e. the intensity of the exercise). In last week’s post I proposed a way of determining what’s important and when throughout a rehabilitation programme using the periodisation principle. We know that often patients need to make improvements across several performance outcomes, however, we also know we require a structured approach and discrete focus on each to achieve optimal improvements. Now look at the size of the text: Strength; Power, Hypertrophy, Muscular Endurance. The larger the size of text, the larger the training stimulus at that corresponding intensity. 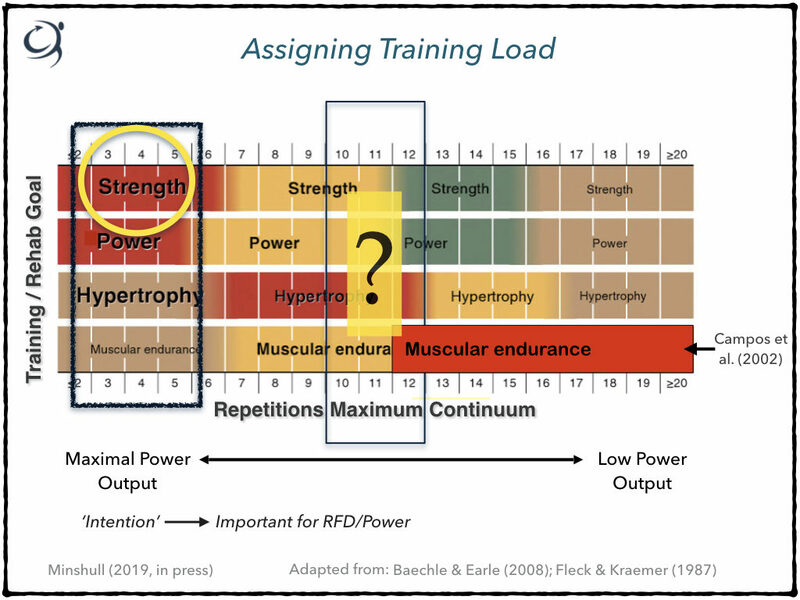 So, if we look at 10-12 RM where I’ve placed the question mark, we can see that we’re not really maximising any training stimulus. Another nail in the coffin for 10-12 reps?! For me this is the easiest of the 3 to rehab. In general, as shown above, resistance training with moderate to low weights and high repetitions has been shown by most studies to be the most effective method to improve local muscular endurance. To be pedantic, we could ask what type of muscular endurance are you focussing on – high-intensity or low intensity? This will be determined by your patient end-goals. If you look at the figure again you’ll see which RM range you need to improve endurance. 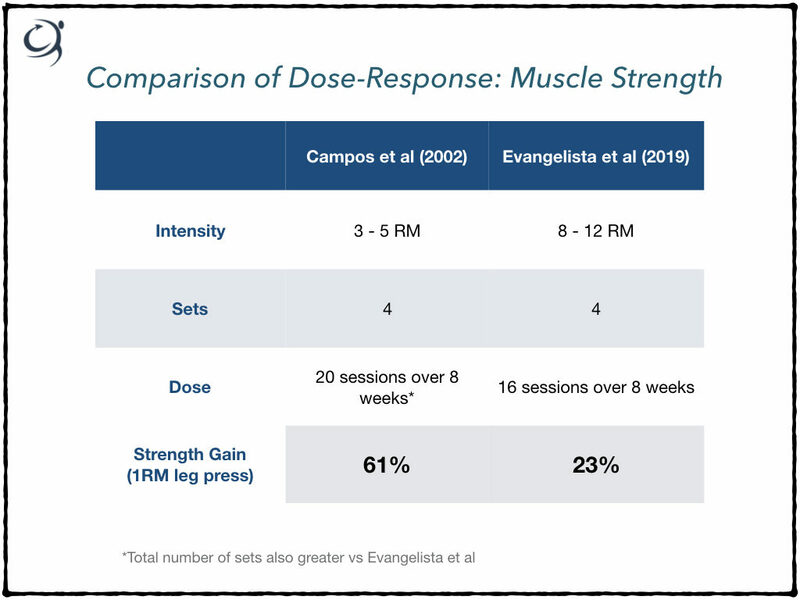 if we’re truly working to failure, (which most exercise prescriptions don’t) 12RM can actually provoke a high-intensity muscle endurance adaptations, as illustrated in the classic study by Campos et al (2002)…so potentially 12RM isn’t all that bad, if done properly! 3-5 RM. Yes, that heavy! You may read studies that have measured strength gains using 8-12RM, or greater, however, when you compare the improvements made, invariably they’re curtailed in the lighter load vs. heavier load studies/conditions. In the comparison above the absolute dose was higher in the Campos study, however, the difference between strength gains is stark and illustrates the general superiority for higher loads for optimising strength gain, a statement supported by a recent systematic review: gains in 1RM strength are greatest in high- versus low-load training (Schoenfeld et al. 2017). So, if you’re looking to be most effective in a limited time it’s 3-5RM ! Remember, power (or rate of force development [RFD]) is the speed of muscle force production, which is determined by factor such as neural drive, fast twitch motor unit recruitment and discharge rate and to some degree the rate of stretch of the elastic component in series with the muscle. So, very similar to the physiologic determinants of muscle strength. It’s not surprising, therefore, that strength training can effect changes in power. The crucial difference is the INTENT to lift quickly and explosively. The external output might not be very fast – imagine how quickly you can lift a 5RM weight from the floor in a deadlift (! ), but if the intention needs to be there. Plyometric Training – Involves a stretch-shortening of the muscle and muscle-tendon unit, a preceding eccentric phase and storage and deployment of ‘elastic energy’ during the concentric phase. Interestingly, weightlifting movements may produce similar improvements in vertical jump height compared to plyometric training. The ultimate training prescription to optimise power development doesn’t exist, it depends on what you’re measuring and how (e.g. RFD and power are measured differently), the most important thing is the explosive intent to shift the load and the maintenance of a moderate to heavy load. Reps, therefore, will be relatively low <8 to minimise fatigue and maximise fast twitch motor unit recruitment and discharge rate. 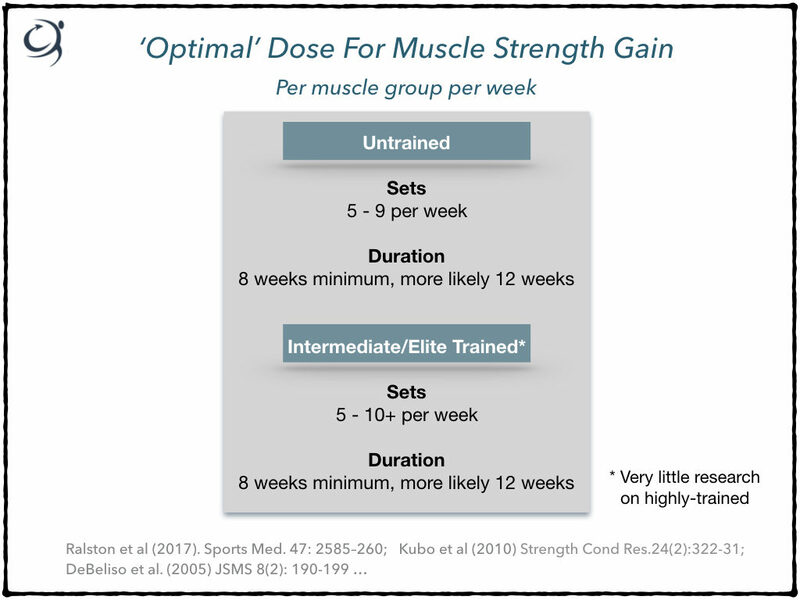 Dose – Sets & Duration…? Clearly, all of these sets will not be performed in the same session (!) and you can determine the intensity/load of the repetitions in each set using the table at the start. At the very least this gives you a starting point and a something to monitor and adapt based on patient progression. In all honesty, and this is purely personal opinion, I think with very well trained individuals, more than 10 sets (50 reps) per muscle group per week would be needed to optimise a strength gain. But as I said, I don’t have any great volume of scientific evidence for this. So, there you have it, I hope you find this useful. At the very least you have an objective structure to follow that can be manipulated commensurate with your outcome measurements with each patient.